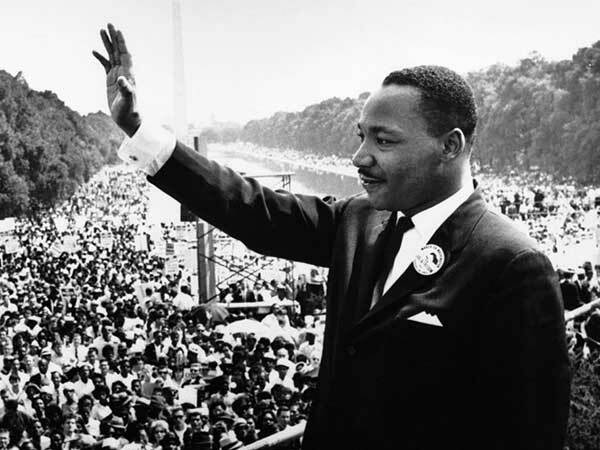 “I have a dream that one day this nation will rise up and live out the true meaning of its creed - we hold these truths to be self-evident: that all men are created equal”. The words of Martin Luther King still resonate five decades later. 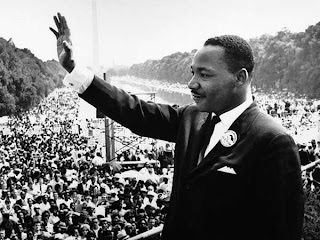 That famous speech made in Washington on 28 August 1963 is remembered in I Have a Dream on BBC Radio 4 today. On the 20th anniversary of his death in 1988 Radio 1 presented “an imaginative collage” with his words translated into lyrics and sung David Daniel and members of the London Community Gospel Choir. Archive recordings were “set to a rap-style rhythm”. “I want people to be mind-blown about how great King was as a speaker and pacifist”, producer Michael Wakelin told the Radio Times. “This is not a documentary or history of his life. It’s a tribute. It’s about the way that we’ve been inspired by him”. The music for The Dream was composed by Richard Attree of the BBC Radiophonic Workshop. This is part of that programme broadcast on Easter Sunday 3 April 1988. You can read King's speech in full here. For many years the Radio Times was rightly lauded for its cover art. I’m thinking in particular of the work of Victor Reinganum, Eric Fraser, Peter Brooks and Mick Brownfield. 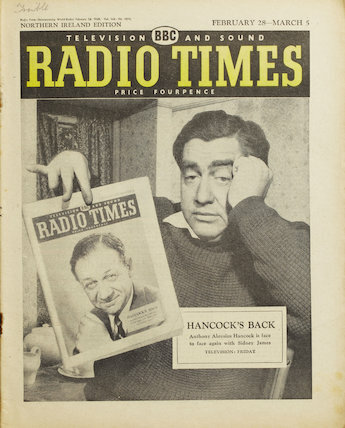 These, and many more, are celebrated at the Museum of London’s exhibition for Radio Times at 90 running until 3 November 2013. These days its mainly photographic covers, commissioned artwork only make an appearance at Christmastime. 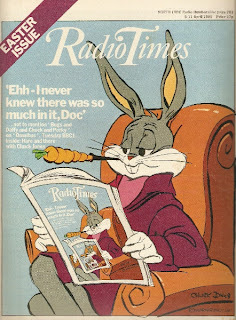 One of my own favourites, for the Easter issue, is this self-referential 1980 cover from Chuck Jones. There are just three broadcasters whose careers started in the 1940s that are still on-air today. All three started off in forces broadcasting. All three did a bit of acting, worked on the Light Programme and Radio Luxembourg and appeared regularly on our TV screens in the 1960s. This broadcasting triumvirate can all be heard on BBC Radio 2. They are David Jacobs, Brian Matthew and Desmond Carrington. Sadly David is hanging up his headphones (as the old DJ cliché goes) and presents his final show (the occasional special, health permitting, apart) this evening after nearly 70 years with the Corporation. For those, such as myself, who have been regular listeners it is a sad day. With David’s retirement we lose yet another link with the past. When he plays a record by Frank Sinatra, he actually met him. Lena Horne, Alma Cogan, Bing Crosby, he’s worked with them too. That breadth of knowledge and the personal anecdotes are, quite simply, irreplaceable. The final show in the David Jacobs Collection airs this evening at 11 p.m. But, if you can’t wait, here’s an edition I recorded on 8 May 2005. 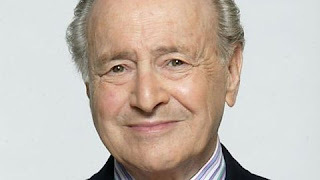 I also urge you to listen to Desmond Carrington’s Friday night show as he played, in full, a show from May 1986 in which he and David reminisced about their broadcasting careers and their favourite music.